Arisaka makes a tool which makes installing scope a lot easier than using levels. It costs about $35 on Amazon (see photos). It assumes that the mounting surface (picatinny or 11 mm) is perpendicular to the bore, which it should be if machined into the receiver. I bring this up, as once again I read about folks who just can't get the cant out! This solves that issue once and for all. That is, scope to gun. 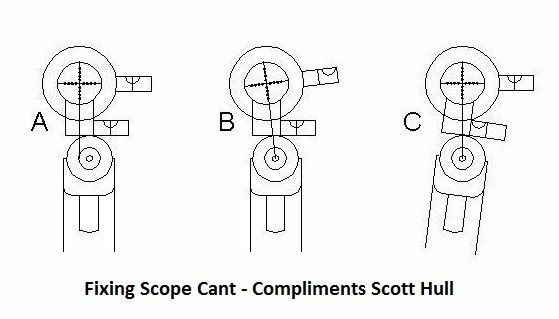 If you're canting because of faulty vision, an external level mounted to the rail, is the best bet. Re: Scope installation tool—NO cant! Pretty cool. I've been using a adjustable machinist parallel for years. Never liked trying to keep a gun level while keeping the scope level method. 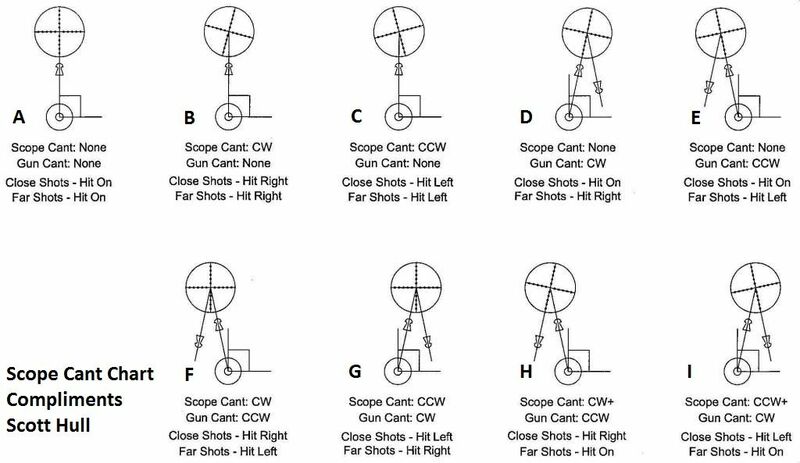 Here is a complete analysis of ALL the possible types of cant error.... and what happens to the POI when shooting closer and further away than the zero distance.... For simplicity, the zero is assumed to be at the top of the pellet trajectory (single point zero)…. When mounting scope on modern rifles (air or powder), I assume the mount is properly centered with respect to the bore. I know that isn't always the case, but I also believe it is a rarity when it is not. 1. Place a vertical mirror 5 yards from the muzzle, and focus the scope at 10 yards.... Scope mounted in rings but loose enough to rotate.... Set the scope at maximum magnification.... This works best if the scope is first centered optically (counting clicks is close enough)…. You brought up two other issues—poorly-made rings and/or poor machining. I'll give you another one—poor scope manufacturing. I have a Hammers scope with a built in level. That "level" is off by about half a bubble, and there is no external adjustment. One of the two UTGs I have is off a bit as well. As I said above, you have to assume things are machines correctly (aligned?-assembled? ), which they are most of the time. Playing the Devil's advocate... When they're not, do you adapt by using your technique? Or do you fix the problem? I think we both know the answer. This parallel method only works on about half the guns I own. The ones with the round receivers such as the 2240 style guns I just do my best to get them level.